Reading and share top 21 famous quotes and sayings about Reinventing by famous authors and people. 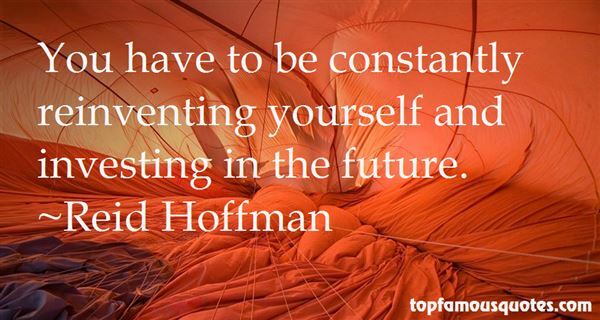 Browse top 21 famous quotes and sayings about Reinventing by most favorite authors. 1. "I'm a huge fan of David Hockney. I love the way he keeps reinventing himself." 2. "I had a teacher, he was 86 years old and his name was Luigi in New York City, and he said, 'Never stop moving. You get to reinvent yourself.' So you have to find ways to reinventing yourself. Especially today, because it's a whole different market - social media is so important." 3. "I think it's become an economic necessity for people to be able to learn and grow throughout their lives, because most people can't get through their entire career with one skill set. We have to keep reinventing ourselves." 4. "We are reinventing the world. We've set the ball spinning with little concern for where and how it's going to stop." 5. "She is focused on living her own full life, following her own agenda and cultivating her actual self, rather than reinventing herself or pining away to be someone she's not." 6. "Great art is always a way of concentrating, reinventing what is called fact, what we know of our existence- a reconcentration… tearing away the veils, the attitudes people acquire of their time and earlier time. Really good artists tear down those veils"
7. "I think you need to do something new to keep reinventing yourself." 8. 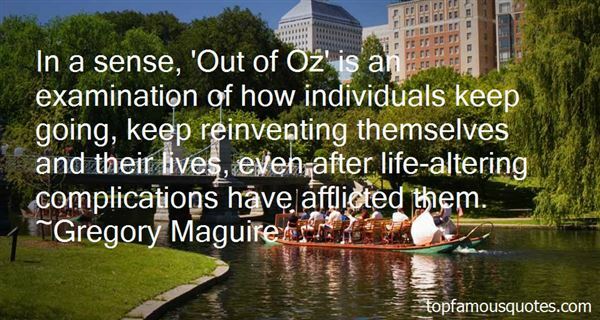 "In a sense, 'Out of Oz' is an examination of how individuals keep going, keep reinventing themselves and their lives, even after life-altering complications have afflicted them." 9. "As writers and teachers we most often don't invent the truths, we experience them and share them, giving our audience the advantage of "discovering" these insights for themselves. There is some brilliance to regularly reinventing the wheel in order to better understand ourselves – not wheels." 10. "What's yer name?" he demanded.The girl searched for a name. "Stella," she said at last, because she had the stars at her fingertips and she had been studying maps of the sky and she was someone else now, not the girl she had been in Ballarat where her grandfather had pointed out the planets and named them, and not the girl she had been in Melbourne, and she certainly didn't want to be the girl she was at her Brisbane school. She was reinventing herself. "No it's not," the boy said. "You're new. Where're ya from? ""I'm Stella," she said stubbornly. "I'm from the moon. You wanna look?" 11. "The lake water was reinventing the forest and the white moon above it, and wolves lapped up the cold reflection of the sky." 12. "I love reinventing my music and myself as well, and that's something my fans love about me." 13. "I found the right man, got married, and just had to keep not reinventing myself, just deciding that it doesn't matter what you are if you are a good person." 14. "What I look for in a script is something that challenges me, something that breaks new ground, something that allows me to flex my director muscle. You have got to think fast in this business, you've got to keep reinventing yourself to stay on top." 15. "I followed the trail out of the room, invigorated by the possibility of reinventing my own body. The meaning was mine, as long as I was with those who had the vision and vocabulary to understand my creation." 16. "Writer's block is my unconscious mind telling me that something I've just written is either unbelievable or unimportant to me, and I solve it by going back and reinventing some part of what I've already written so that when I write it again, it is believable and interesting to me. Then I can go on. Writer's block is never solved by forcing oneself to "write through it," because you haven't solved the problem that caused your unconscious mind to rebel against the story, so it still won't work – for you or for the reader." 17. "You have to be constantly reinventing yourself and investing in the future." 18. "I wanted to become an artist because it meant endless possibilities. Art was a way of reinventing myself." 19. "I admire Madonna because she always did whatever she felt like doing. She went through some controversial periods when people rejected her, but she kept on reinventing herself." 20. "Sometimes time spent reinventing the wheel results in a revolutionary new rolling device. But sometimes it just amounts to time spent reinventing the wheel." 21. "Oftentimes I felt ridiculous giving my seal of approval to what was in reality such a natural thing to do, sort of like reinventing the wheel and extolling its virtues. Had parents' intuition sunk so low that some strange man had to tell modern women that it was okay to sleep with their babies?" The art of not experiencing feelings. A child can experience her feelings only when there is somebody there who accepts her fully, understands her, and supports her. If that person is missing, if the child must risk losing the mother's love of her substitute in order to feel, then she will repress emotions."